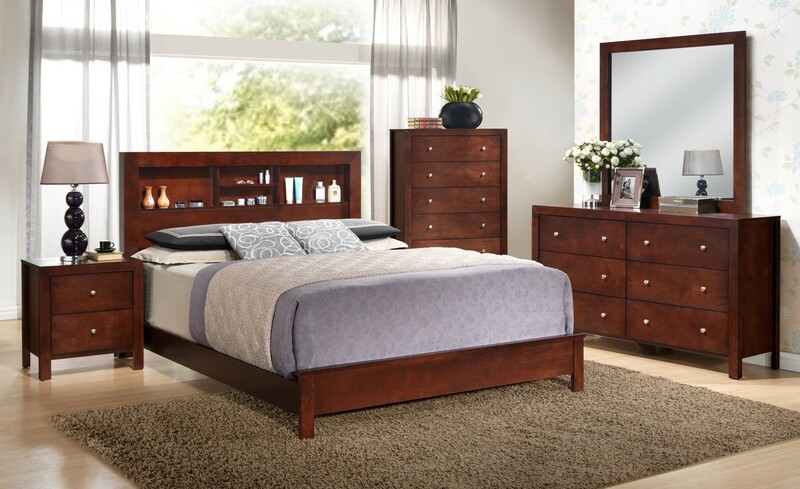 This Wooden Finish Sturdy Bedroom Set G2400B by Glory Furniture has become popular for its durable nature and book case headboard. The wooden finish makes it durable and very impressive. The bedroom set contains a bed, a dresser with mirror, a chest, a TV dresser and a nightstand. This solid wood bed is sturdy. The dresser and the chest have enormous storage space with six and five drawers respectively. The bed comes in varying sizes, such as full, twin, queen and king bed. The wooden bookcase headboard is another exciting addition. It adds to the style quotient while providing functional use as well. The dresser has a sleek rectangular mirror that helps to get dressed and to store all your things. The drawers look extremely stylish with the silver hardware. The chest is the perfect place to keep all your valuable belongings and the nightstand too has drawers to keep important things like specs and wallet, etc. This elegant furniture set is available in a very affordable range.